All throughout the softball season, Inspector Gadget had been pestering us to try Applause Japanese Restaurant in Marpole. For various reasons, we never made it out there as a team. He threw out the idea of meeting up for a weekend lunch or something. Yet again, it never happened. Was it never meant to be? Well, he made sure that I got to try his favourite local Japanese restaurant by suggesting we meet up during the Christmas holidays. We set a date and yes, we finally made it. So what's so special about Applause anyways you might be thinking. First of all, it is not exactly located in the hub of activity. 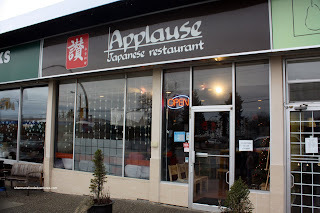 Located in a small strip mall in the middle of residential Marpole, Applause advertises itself as an "Izakayaish" Japanese restaurant. Oh really? A restaurant with an identity problem. Great, we've all seen that before haven't we? Well, all the staff are Japanese except for the sushi chef/owner who is Taiwanese. Hey, I have an open mind. Let's allow the food to do the talking shall we? We were a little late arriving due to Christmas traffic. Actually I think the sinkhole on Marine Drive helped make 49th resemble #3 Road in Richmond. S orry, I had to sneak a Richmond reference in there! For a weekday, the restaurant was packed. Apparently this is the norm. When we finally got down to ordering, Inspector Gadget made sure we didn't order any duplicates and in fact, selected some items for variety purposes. Once again, I am so lucky that people go out of their way to help me out! Either that or I've got them well-trained. If I hear the word Izakaya, I must get Ebi Mayo. I just have to, it's my favourite. 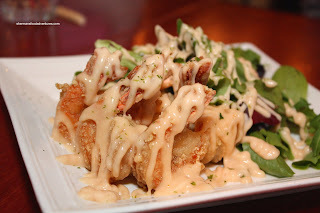 As with most versions of ebi mayo, there is usually an obscene amount of sweet mayo drizzled on top. Hence the name... However, by looking at the picture, you can see that there was not only an obscene amount... the whole darn thing looks "obscene". Make what you want of it... Anyways, the shrimp itself was only lightly battered and fried. Thus, it was not crispy per se. 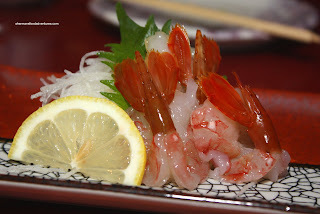 It was still perfectly cooked in terms of the shrimp itself exhibiting a nice snap. As mentioned the mayo was sweet and ahem... once again, I got it all over my face... (see Zakkushi). 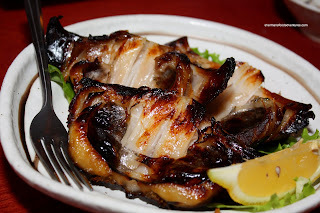 One of their daily specials was the BBQ Black Cod Collar. Now if you are familiar with black cod, the flesh is quite oily and moist. 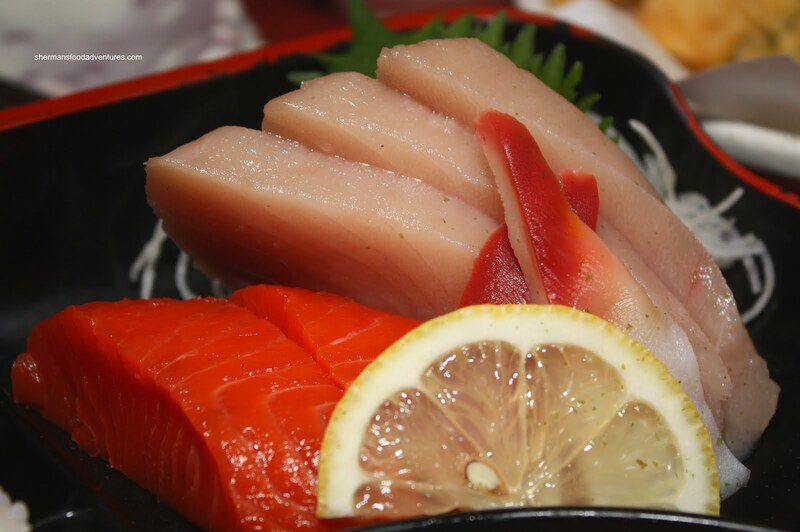 However, for those w ho eat whole fish, the meat around the fins, collar and cheek is where its at. The meat tends to be slightly chewier with some bite. Of course, I had to order it. It was exactly how I like it. BBQ'd until it had a nice colour while not overcooked. Yummy. I love picking at bones, whether it be pork or fish. For his appetizer, Inspector Gadget had an order of the Amaebi. As you can see from the visuals, the shrimp was glistening with freshness. He remarked it was naturally sweet. 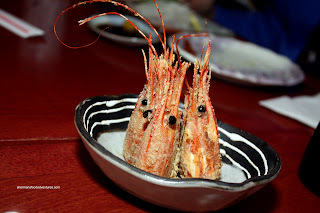 The second part of this dish was the Fried Shrimp Heads. You gotta love a place that serves Japanese food the right way eh? These were fried up perfectly. How so? When the heads are crunchy enough to eat whole without splitting your tongue or mouth open, that is perfect. The natural sweetness of all the great things you find in the shrimp head (minus the bitter sac) makes it a joy to eat. How I love head... uh! I mean fried shrimp heads! For my main dish, I went for the Chicken Katsu Curry. 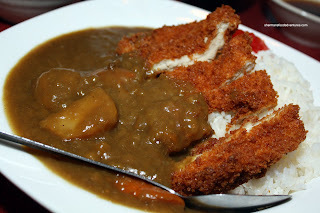 For those unfamiliar with Japanese curry, it is very different than authentic Indian curry. Rather than being spicy or even complex in flavour, it is predominantly sweet. Depending on the version, you might not even know you are eating curry. The one I had at Fujiya was so sweet, it was more like liquid candy atop steamed rice! This one was sweet while not being overly so. It still had a bit of curry flavour and some spice. The chicken katsu was fried up nicely with a crispy coating yielding to tender chicken meat. Combined with the chewy rice, it was a satisfying and large dish. This reminded me of the one I had at Kimura except we had beef instead of chicken. Inspector Gadget surprised me by ordering the Miso Ramen. Based on my past experiences, regular Japanese restaurants not specializing in ramen produce a sub-par product. Imagine my surprise when I was proven wrong in this case. I got a good portion to try and the soup was pretty decent. There was actually some depth and it didn't merely taste like miso soup. Furthermore, the noodles were al dente and not too thick. Of course, I need to talk about the pork (or chashu) and it was not too bad either. It was a relatively large piece which has a nice pork taste with a bit of fat. Decent ramen for a non-ramen shop. Guess what we ordered for the kiddies? Uni? Yah right, the chances of them eating uni are as good as my chances of returning to Kawawa. 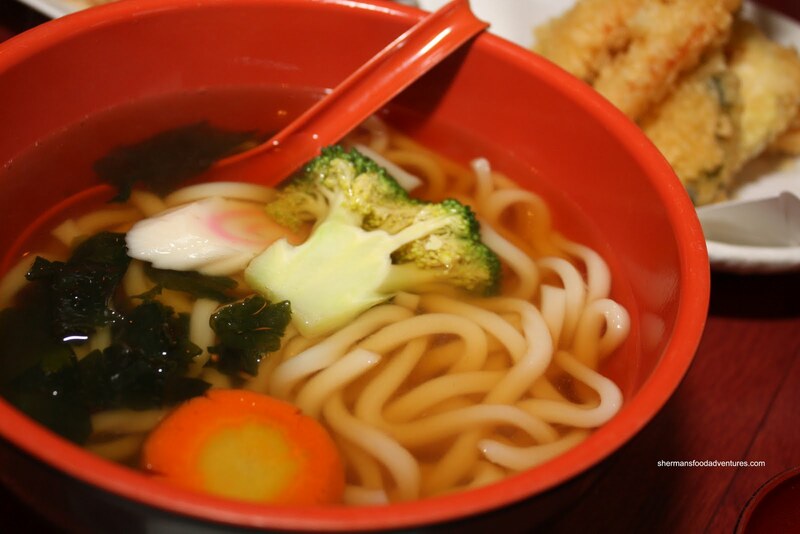 Naturally, we got the Tempura Udon for them. 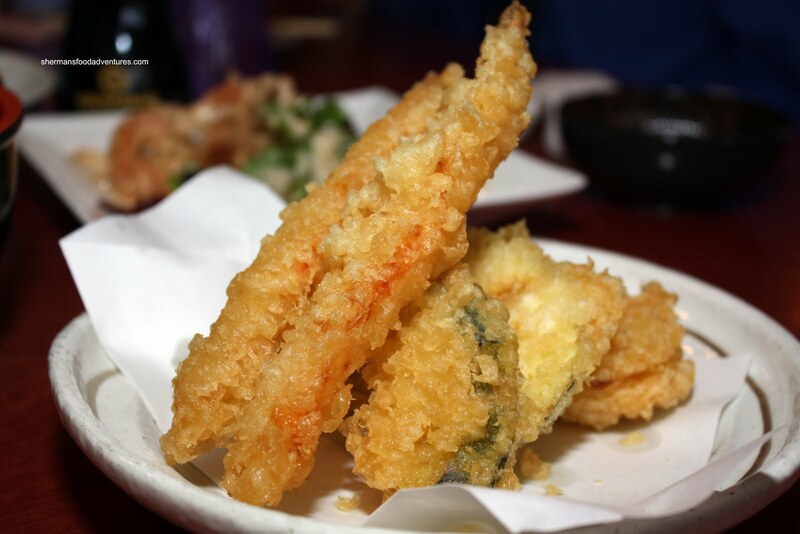 Served on the side, the assorted tempura had a disturbingly thick batter. Despite this, it was crunchy and didn't seem heavy. Even after sitting around for awhile, it still stayed crunchy. Definitely better than it looks. As for the udon, it was still chewy and the broth was quite light. Nothing amiss or amazing about it. Viv wanted a bit of variety and settled on Bento Box D which included Salmon, Tuna & Hokkigai Sashimi, Assorted Tempura, Salad, Chicken Teriyaki on rice, Salmon Maki, Miso Soup and Fruit. We enjoyed the large slices of sashimi, it was fresh looking and tasting. In fact, the wild sockeye salmon was very sweet while the tuna had pleasing texture. The hokkigai had its requisite chewiness and sweetness. As for the chicken teriyaki, it was okay, if not a bit dry. The modest amount of sauce was welcomed since too much results in everything tasting sweet. Much like the curry, the rice was slightly chewy and acted as a good base for the chicken teriyaki. 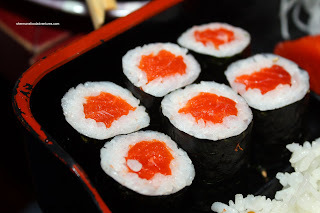 In terms of the sushi rice, I tried a leftover piece of inari nigiri from Inspector Gadget's daughter. She ate the sweet fried tofu skin and I had the rice. Consequently, it was somewhat sweet from the remnants of the tofu skin. However, I still sensed rice vinegar and the texture of the rice has bite and chewiness. Pretty good sushi rice. In fact, the food here at Applause is very solid. For the variety we tried, the restaurant does succeed in being the jack-of-all-trades. 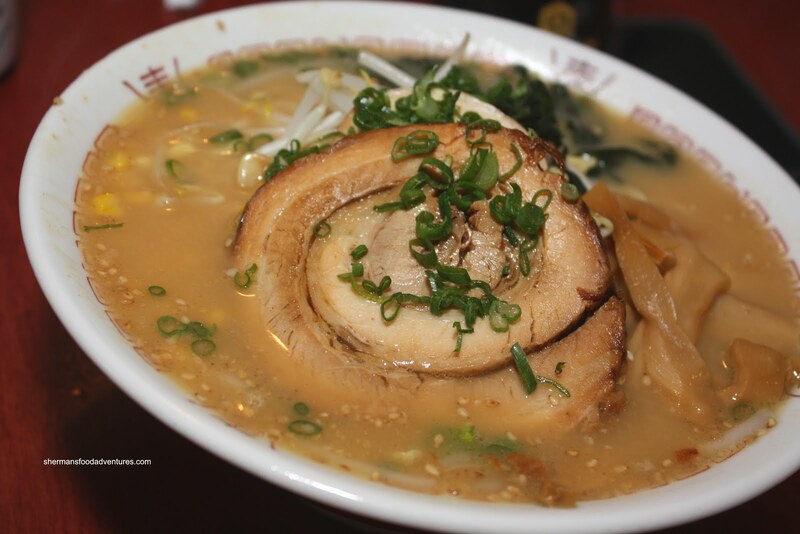 From the Izakaya dishes, to regular Japanese fare and the decent ramen, nothing was amiss. Sure, there is better in all 3 categories within Vancouver, no doubt about it. But if it's a variety you want that also looks the part, Applause is more than acceptable. Out of all the options served, which one seems to be "better"? Based on the description, this reminds me of Tenhachi, where the core cuisine is homestyle Japanese cooking; however, due to "demand", it includes sushi and other dishes. As for the refernces, man... Just when I thought I had forgotten about them!!! I love this place! If you ever go back, do try to miso eggplant!